Centrally located between the Rogers Centre, the Air Canada Centre and BMO Field, Steam Whistle Brewing, an independent brewery housed in Toronto’s historic Roundhouse caters to sports fans looking to add to their Game Day excitement with brewery tours every half hour and often special food & entertainment. Josh Hillinger, Retail Manager at the underdog Canadian craft brewery, shares “Every Jays game day we see hundreds of jersey-wearing fans, young and old, come into the brewery. I wanted to acknowledge this group of visitors with some ballpark-themed fun.” Josh has enlisted key restaurateurs, food trucks and pop-up food vendors to bring their specialties to the brewery while DJ McQueen or live bands pumps up the crowd with great tunes and shout outs on key weekend game dates. A visit to Steam Whistle Brewery pre- or post-game always includes a friendly greeting from their staff offering a complimentary taste of this award-winning Pilsner. Tours are available on a first-come-first-served basis and tend to book up for on game days by 2pm, so come early if you want to secure a tour reservation and enjoy the good vibe and refreshing beer at $4 a bottle while you wait. New this year are draught pints for $5. 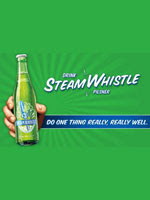 Steam Whistle Brewing, open daily for complimentary samples and brewery tours, will be ‘stepping up their game’ to compliment the Blue Jay’s season. Baseball fans are encouraged to drop by the brewery before games on Jay’s game day Saturdays through the spring and summer for a whole lot of fun: live music or Djs; gourmet food c/o a changing roster of pop-up food vendors and/or food trucks; $4 bottles or NEW this summer - draught pints of our beer ($5).